Ask any rollergirl, skating the the best thing she ever got started and yeah you should get started! Ask about what gear to get started with, and whaaaaaaa. Girls love their gear. I'm just saying, I've been skating for just about two years and "PowerDyne Torq nylon plate" only started to sound like English to me, like, last week. There's a lot of stuff that you can know about skates and gear, but you don't have to know it all at once. This is the beginner's guide to gear, covering the basics: helmet, mouthguard, wristguards, elbow and knee pads, and skates; the intermediate guide will get into bearings and wheels, and the advanced guide will be about plates and cushions. And I'm just going to talk about my gear, and later on I'm going to have some other girls in talking about their gear & it'll all be good. I just got this helmet. I left my old helmet sitting on a bench by the lakefront path, I'd just skated 13 miles in a bad mood —which is rare, and should have been a red flag— and so damn tired, plunked down on this bench, packed up my gear, and walked away from my helmet on the bench. 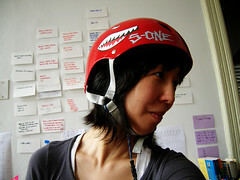 I loved my old helmet; it was a L/XL S-One, though now they make them in separate L and XL sizes. Which makes more sense. This new helmet fits better; it's snug, doesn't go askew in falling drills. This time the ProTec felt more comfortable than the S-One, so I went with that. 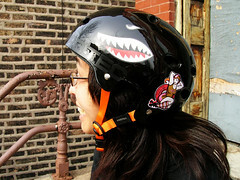 I also had to replace my mouthguard that was attached to my helmet. This is the "better" mouthguard with $7,500 dental insurance, not the "best" with $10,000 insurance. Normally I'd be inclined to get the mouthguard with the most insurance, but the "best" mouthguard said all this stuff about positioning the lower jaw down and forward and the tongue up into the roof of the mouth —gah, too much information. And I only fell on my face that one time. I walked away from my wrists a few months ago... I know, I have a problem. I've been wearing Biggie's old Razor wristguards, and they're okay. I think you can get them at Target or Kmart even. I used to have Pro-Tec Street wristguards from Sin City Skates, and they were okay too. My elbows are sweet, though I don't think I've actually ever fallen on my elbows. What my elbows mostly do is sweat, which makes your gear smell and then fall apart. The useful tip I have about elbow pads is, cut the toes off some old cotton socks and wear the socks under your elbow pads. These are the Pro-Tec knees that I got two years ago; they're fine for a beginner, and also fine for me because I don't get that banged up. I'm due to replace all my gear, as it gets worn or, you know, lost. Though actually, I probably don't have to replace my elbows; they're still like new, either from not falling on them or from wearing socks under them or probably both. At some point, I'll probably just get a new set of Pro-Tec Street or Triple Eight gear. I originally got my gear from Sin City Skates, and they did me right; but I'll probably get my new gear from Uprise or Orbit Skate Center, so I can try things on. My R3s, with extreme lacing for my wide feet. Oh and, those aren't the toe stops they came with. My Vandals, with my old Flat-Out wheels. I started with the R3 and later upgraded to the Vandal, both of which I love. I use my R3s now for outdoor skating —you need different wheels outdoor versus indoor— and my Vandals for indoor practice. Personally, I think this is ideal; so to my mind there's no stress about starting out with the less expensive R3s to see if you like this skating business & then loving it and spending the grocery money on some sweet Vandals. 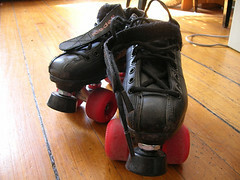 But if you can scratch your itch with one pair of skates, I think these are both fine beginner skates. 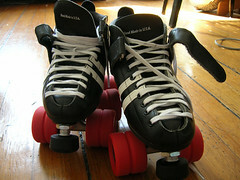 I won't say "you can't go wrong," because where you can go wrong is getting skates that don't fit. Have somebody fit you for your skates, I highly (har) recommend Steve at Lombard Roller Rink! A. For the R3, I am not a fan of the Cayman wheel. If you have the option to upgrade to, say, a Tuner tite or Flat-Out wheel, I'd definitely go for that. Also the R3 comes with ABEC-3 bearings, which are nnnnnnn. All I'm going to tell you about bearings right now is that for ABEC-rated bearings, the higher number is the better or more advanced. If you have the option to upgrade to ABEC-7s, I'd probably go for that too. B. For the Vandal, I think the standard wheel is the Tuner orange "firm" wheel & you may want to swap that for the sky blue "tite" wheel, which is grippier, or a Flat-Out wheel, which is even grippier. And all I'm going to tell you about wheels for now is that harder wheels are faster and can slip (a little) on the floor, and softer wheels can be (a little) slower but grip on the floor; and floors, too, can be slippery or grippy. You will be fine at any roller rink with the firm wheel; but if you skate in more random spaces, like school gyms, you probably want a grippier wheel.